Comments End August 29th, not much time left! Public comments due August 29, 2017 at 11:59PM EDT. Electronic comments submitted HERE. Please compose your comment somewhere that it can be saved in the event of an issue with the electronic comment page. There are fewer than 150 Mexican wolves in the wild and only 250 in captivity. Mexican wolf populations in the United States and Mexico are isolated. The lack of connectivity and the low numbers of each isolated population (which should number at least 200 individuals with a total of 750 wolves) threatens the species with extinction. The proposed plan would turn over management of these rare wolves to state game boards. The last time states were in charge of lobos, the wolf population plummeted due to excessive trapping and shooting of Mexican wolves, authorized by state game boards. State game boards are comprised of political appointees who usually do not have a background in science or conservation. Rather, these appointees usually come from ranching or hunting background. 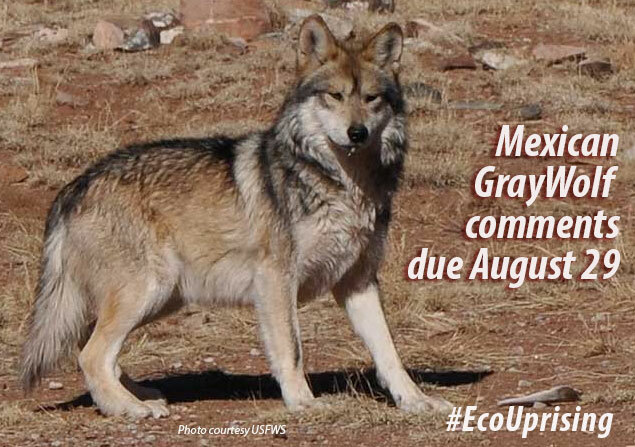 USFWS and not state game boards should be in charge of whether and when to release Mexican wolves from captivity to boost the genetic viability of the population. There should be a plan to discourage conflicts with livestock and lobos and provide education to promote tolerance of the animals within their habitat. To achieve such social tolerance, there needs to be a commitment to funding non-lethal deterrents and work on a holistic plan with local livestock operations to reduce conflict between wolves and livestock and yet maintain a healthy wolf population. Further, lethal control cannot be a solution. If it is, livestock operators will likely never embrace tolerance and use of non-lethal methods. If you have not signed the wolf petition, please do so now!